Last week was a good week for UK research. In his Autumn Statement, the Chancellor of the Exchequer Philip Hammond announced a significant increase in R&D investment. Starting next year, the budget will ramp up steadily to deliver an increase of around £2 billion per year by 2020-21. The total additional spending over the next four years will be £4.75 billion. This is a substantial uplift in the UK R&D budget. Analysis by Scienceogram suggests that it will produce an increase of nearly 10% relative to present levels. We at Science is Vital welcome this increased investment. It is a clear step in the right direction. It is a step that we urged on the government during our campaign in the run-up to the Comprehensive Spending Review in 2015. It’s also a credit to all our supporters – scientists and members of the general public – who were part of that campaign and sent postcards to the then Chancellor, George Osborne, telling him why science is vital to them. Details of how the new money will be allocated have yet to be announced, and we’ll be watching closely as more information becomes available. What is clear is that the cash will be used for both research and innovation funding – part of the May government’s decision to pursue a more active industrial strategy. As James Wilsdon and colleagues observed in the Guardian, this will have to be handled carefully to deliver the greatest economic dividends, but that is the sort of problem that researchers will surely welcome. While the boost to R&D investment has been warmly received across the research and innovation base in the UK, we still need to remain vigilant. The forecasted increases assume that all the elements of the R&D budget, such as spending by government departments, will not be trimmed in the wake of the new award. It also assumes that research income from the EU will remain at close to its current level until 2020. If the UK is excluded from EU research schemes after Brexit, the lost income could completely wipe out the beneficial effects of this new investment. It is vital that the Secretary of State Greg Clark makes the strongest possible case during Brexit negotiations for maintaining UK participation these EU research programmes, for both the funding and the collaborative opportunities they offer. If this proves not to be possible, we will need to ensure that the government replaces EU funds, perhaps with a new scheme aimed at fostering international collaboration. After a fracturing EU vote, science – and the networks between researchers – remains one of our best hopes for demonstrating Britain’s capacity and willingness to partner with the international community. Finally, the Chancellor’s announcement probably won’t have much effect on the fraction of GDP that the UK spends on R&D. 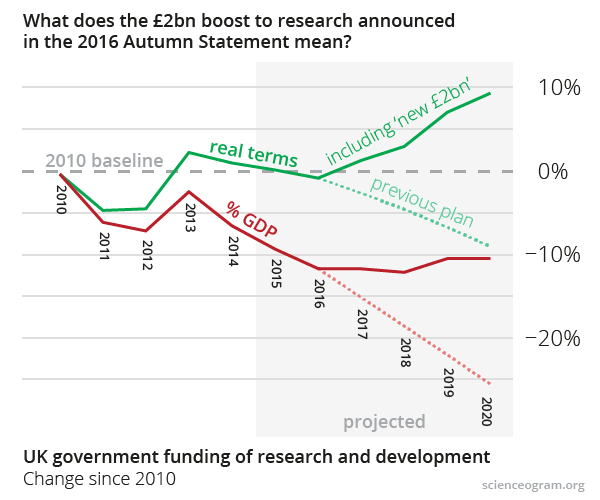 This means the situation is likely to remain much as we reported it when we broke the news that UK had slumped to spending less than 0.5% of GDP on public-funded R&D – and well short of Science is Vital’s target of 0.8%. Given the economic and social benefits of investing in research, we’re going to carry on making the case for research funding – and we hope you’ll join us.